You are currently browsing articles tagged Fonts Point. 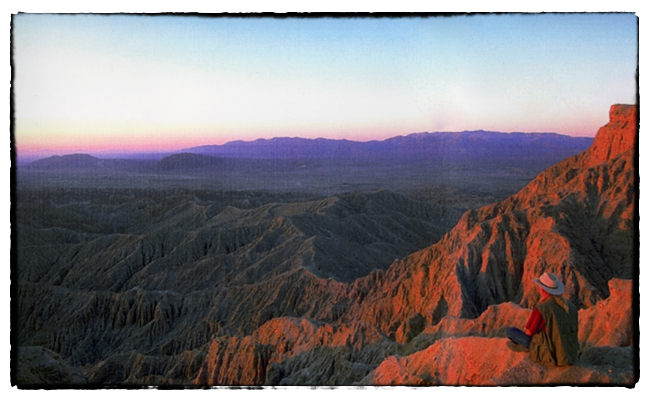 “Borrego” Paul looking out over the Borrego Badlands at sunset. Dale Conour, a travel editor at Sunset who is also an amateur astronomer, wanted to tag along on my trip to Anza-Borrego in hopes of catching a glimpse of the Perseid meteor shower. This was during my last trip there about ten years ago. As Dale and I drove to Anza-Borrego he warned me that he wasn’t really a desert person. In fact, he said, the last time he’d spent any time in the desert, he went on a guided hike where he bumped into the painful barbs of a cholla cactus not once but twice. “They seem to be attracted to me,” he said. From that point on, I called him “Cholla” Dale. It seemed to suit him. Nicknames are big in the desert. There was “Death Valley Scotty,” an eccentric from Kentucky who convinced a Chicago millionaire to invest in a gold mine in Death Valley and then build this odd two-story Spanish Colonial home in the desert called Scotty’s Castle. There was the prospector and horse thief, “Peg Leg” Smith, who traveled to the Borrego Badlands in the 1850s and supposedly found a gold mine in the Santa Rosa Mountains that people are still looking for. And then there’s “Borrego” Paul. “Borrego” Paul used to lead Jeep tours out in Anza-Borrego. On this particular drip, “Cholla” Dale and I were sitting out front of Casa del Zorro about an hour before sunset waiting for “Borrego” Paul to come pick us up and take us out into the desert to look at stars. “Borrego” Paul was telling us all about Peg Leg Smith when, without notice, he whipped the Jeep off the highway and down a dry sand wash, plumes of dust rising behind us. He was taking us to Fonts Point. After a few miles we parked at an informal parking spot in the desert and “Borrego” Paul led us across a smooth bluff where, suddenly, the most astonishing view appeared before us. Hundreds of feet below were the convoluted mud hills and sinuous, corrugated ridges of the Borrego Badlands, a landscape shaped from thousands of years of erosive wind and water. There was no wind on this warm twilight eve, no distant sound of jets or cars, no barking dogs or singing birds. In fact, I’d say it was the most silent spot I’d ever been to. Not until the sun had completely set and the Badlands had all but disappeared into their dark shadows did we finally leave. We fishtailed in the Jeep through the soft sand, lights off, as the night cloaked the desert in blackness until Paul suddenly stopped the Jeep in the middle of nowhere. We unloaded folding chairs, opened a bottle of Veuve Clicquot, and with heads tilted back towards the moonless sky, watched awe-struck as meteors flashed and burned above us with such frequency that after a few minutes we stopped even bothering to count them. “It’s like being at the beginning of time,” said “Cholla” Dale, happy as could be.